WASHINGTON - The lead ministers for Canada, the U.S., and Mexico will not be attending the current round of NAFTA negotiations in Mexico City. It's the first time that's happened since the talks began. 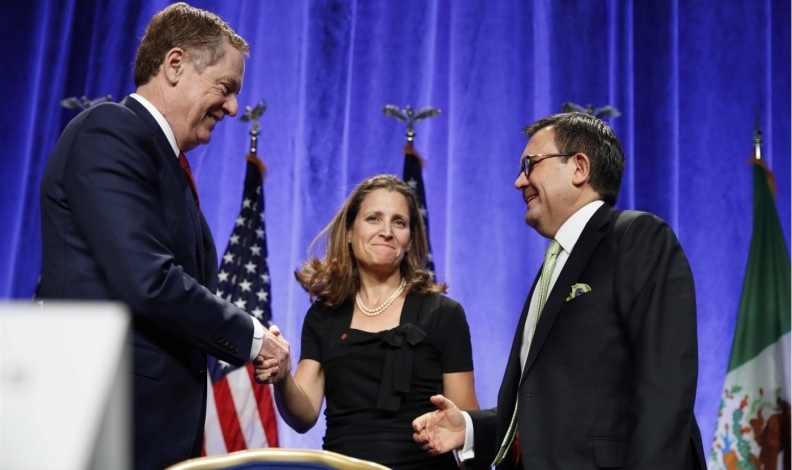 Canada’s Chrystia Freeland, Robert Lighthizer of the United States, and Mexico’s Ildefonso Guajardo have declared they will not be making a public appearance at the fifth round of negotiations currently getting underway. They say they just met and had substantive discussions at the Asia-Pacific summit, and also intend to remain in constant communication with their chief negotiators. Insiders expect the current round to yield few major developments. They describe it as a calm between two storms: The previous round featured public squabbling, and the final rounds are expected to produce their own fireworks, with the biggest sticking points being tackled amid threats of a U.S. pullout. Sources say this round will likely see incremental progress on less-controversial issues, and modest temperature-taking on the hotter ones. Some of those more contentious issues are U.S. demands some have been labelled “poison pills.” They include demands for an increase in American content in the auto sector, a sunset clause, changes to procurement rules, and dismantling Canada's protected dairy industry.